1. Preheat the oven to 180°C, gas mark 4. Remove all the packaging from the cheese. Use a bread knife to cut the top 1cm from the loaf. This should leave an exposed area of bread about the circumference of the whole cheese. 2. Using a knife, cut about 3-4cm down into the bread in a circular shape, then remove the contents to create a snug hole for the cheese to sit in. Using the bread that you have removed, put about 4 tbsp of the smallest pieces into a food processor with the rosemary and thyme. Blitz together to make crumbs. Cut any remaining bread, including the lid, into large croutons. 3. 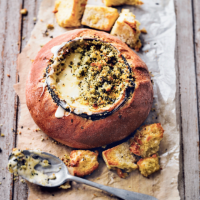 Place the cheese into the hole in the bread and slide the loaf onto a baking tray. Sprinkle the herbed breadcrumbs on top, then drizzle with a little olive oil. 4. Bake in the oven for 20 minutes, then add the large croutons to the tray and bake for a further 10 minutes until the cheese is totally soft and the bread is a dark golden colour. Serve the cheese with the croutons to dip into it.